This year we have done a lot of trips, but this quick little weekend we took to Chicago in October might be one of my favorite. We packed so many great things in such a short amount of time, and I left feeling more in love with Chicago than when I arrived. 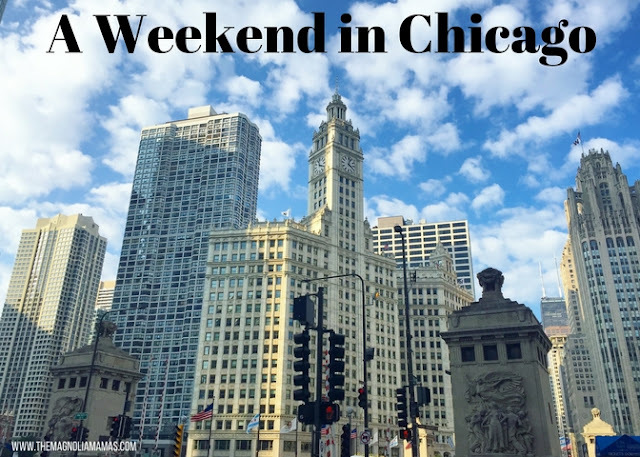 It's such a fun city to visit, and perfect for a quick weekend getaway. We've been to Chicago a few times, but the last time I was in Chicago was when Cute was just a baby and we went with my baseball loving family for a game at Wrigley Field. This trip was completely different, and in six short years I can't believe how much of the city had changed already. We planned this trip on a whim. Mr. Cute was traveling to Chicago for work that week, and I decided to meet him up there the weekend before to join in the fun. Since our kids are in an easier spot to leave behind and I'm not pregnant or nursing someone it is much easier to do little trips like this. I love it and it's so much fun traveling with my travel partner for life. We took a mid-day flight out of Atlanta, and the flight is super quick. The mom in me packed all these snacks, purchased a book in case my phone battery died, and was way over prepared for the quick hour and a half flight. It was so nice! We landed and checked into our hotel after a quick cab ride, and I was in awe. Our hotel was GORGEOUS! Mr. Cute booked the Palmer House Hotel in downtown Chicago. It is a historic hotel built in the 1800's, and stepping into parts of the hotel was like stepping back in time. Every little detail was spectacular! It's full of rich history and has an interesting story to it's creation. I loved that over the years they've kept a lot of the details to the original hotel. The only place that we felt it was a little more modern/contemporary was our room. Aside from the size you would never have known it was part of a historic hotel. We stayed in a regular guest room on one of the Executive floors. Not gonna lie...it was pretty small, but with this trip just being the two of us it was the perfect size. After we settled into our room we headed out to check out the city. It was a fairly warm day, especially for Chicago this time of year, and we wanted to take advantage of it especially once we saw the weather for the rest of the weekend would be cold and rainy. Millennium Park was a short walk from our hotel, and the infamous Cloud Gate sculpture was one of the few things we didn't see on our last trip. So we decided to be super tourists and check it out. The park itself is beautiful, and made for a pretty stroll. Once we made our way into the area with the Cloud Gate (also known as the "bean") we quickly realized we weren't the only tourists taking advantage of the park on a pretty day. There were tons of people around checking out the sculpture and posing in front of it. We held back a little bit to wait our turn, and then we realized you just kind of have to jump in. We didn't want to spend too much time waiting to take a bean selfie since we had planned an early dinner. Later as we looked through photos online when we were reading about it, we realized we were bean photo taking amateurs. Maybe next time we'll put some thought into it. Or at least figure out the trick not to make yourself look 400 pounds. After we left the bean we made our way towards the river and the Magnificent Mile. Mr. Cute wanted to do some shopping, and I was in desperate need of a rain coat if I was going to survive the city over the next few days. After walking around a bit, and doing our fair share of shopping, we headed back to our hotel to get ready for dinner. Once we were all cleaned up, we took a quick cab ride to a Swift & Sons. Mr. Cute made a reservation on the recommendation of a friend who lives in Chicago and let me just say - it lived up to it's glowing review. I tried to stealthily take photos because the decor inside was so neat, but I was starting to embarrass Mr. Cute (more than I normally do). It was one of the best dinners I've had in a while and I would totally fly up to Chicago tomorrow just to have another meal there. So yummy! After we savored each of our five courses, we made our way back to the hotel to put on some stretchy pants and turn in for the night. I will share our next day and a half in Chicago tomorrow. Be forewarned we packed a lot into a short amount of time. Be prepared a picture overload and lots of Chicago style pizza!